Human brain, human lymphoid follicle tissue. Our Abpromise guarantee covers the use of ab52271 in the following tested applications. WB Use at an assay dependent concentration. Predicted molecular weight: 10 kDa. Weakly binds calcium but binds zinc very tightly-distinct binding sites with different affinities exist for both ions on each monomer. Physiological concentrations of potassium ion antagonize the binding of both divalent cations, especially affecting high-affinity calcium-binding sites. 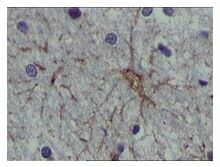 Ab52271 staining human brain tissue; paraffin embedded. 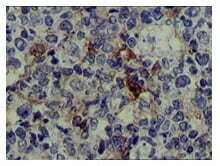 Ab52271 staining Human lymphoid follicle tissue; paraffin embedded. ab52271 has not yet been referenced specifically in any publications. Publishing research using ab52271? Please let us know so that we can cite the reference in this datasheet. There are currently no Customer reviews or Questions for ab52271.